these are NOT first come first serve! sorry, no anthro designs this time! toyhou.se/1606597.-auriel- If it’s still open? If so send payment here! Ah thank you Eellie <3 sending now! whats your paypal? ill send an invoice! Ahh I can't afford it rn but please ping me next time if possible!! psst will you ever open these for anthro ones? i have a plushpon design i thought would look really cute in your style! okay! 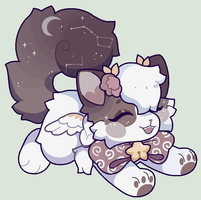 <3 just checking, would you be comfortable drawing the "farm" adopt from plushpon's most recent adopt batch? that's the one i have! I'd love to draw them in the future ! nice!!! <3 i'm looking forward to it! I have accepted 2 slots but if you would like to wait until next time im open, i can ping you when I am! If you are okay with them being drawn feral, I can do them for you! Tbh I was wondering if you ever did commisisons that were more human like! Your art is absolutely lovely but the closest character I have to Anthro is a man with lion ears and a tail! If not it's totally fine I was just curious! oh no worries! your art is still lovely have a nice day! Sorry, customs are not open yet! or you mean me draw a character as a lion? or just based on colors alone? Oh, that would be more of a custom design and those are not open at the moment! Thank you for your interest though! ICON Commissions [ closed ]Each is $35. Any character! What I won't: NSFW, Fetishes, Realistic, Offensive stuff, Anything I feel uncomfortable with ayment via Paypal only! Commissions (closed)This journal updates on the 3rd of every month when I open commissions! I will be noting accepted commissioners in the next few days after opening! If you need to back out and withdraw your commission, please let me know. If you do not reply to me within one week, I will assume you’re unavailable and will not take your commission. By purchasing a commission from me, you automatically agree to my Terms of Service. Paypal only, I'll send you an invoice. I only start working after payment.For additional characters, add half of the original price. you will get a 50x50 and a 100x100 version!! IF paying with paypal, please let me know your email for the invoice. After ive sent the invoice you have 24 hours to pay it, unless other has been talked about!! IF paying with points, after ive given you instruction on how to pay(gift option/commission widget) you have 24 hours to pay it, unless other has been talked about!! reply HERE if you want me to let you know when i reopen these!! Pixel Slots - ClosedJust taking one icon, so I can grab my twin something she's been after/waiting for. The slot is not first come first serve. To try for a slot, please post below with your character reference. Feral only. Sorry, but I am still not comfortable with my human pixels yet. At least, not enough to sell them. Humanoids, like grems, are okay. All prices are in GBP, please check the conversion rate! (CLOSED) Commission InfoCommissions are currently closed! Do NOT send the points/money until I ask you to. You may cancel the order anytime, but after you have sent the payment, there are no refunds. I will not start the commission until the payment is sent. You may request a specific due date for your commission. Otherwise, I will complete the commission 3 weeks after you have sent the payment. (The due date will be posted on my To-do List). There may be a delay if there is an emergency. Price depends on the animation you want! For something like the current example (quick bark) it'd be $10.00! The animation will be a tail wag and a blink, if you want some other animation let me know. decided to finally crack down on prices, and with my to-do list getting shorter, i'll have this up in the mean time! 1. I have the right to deny your request! some characters I know I'd have a hard time working with, ESPECIALLY with pixels. 2. I demand full payment upfront; no excuses. I can't take chances with being scammed. This also means payment will be sent via invoice. 3. This may take a while, be patient. Very simplified. Minimal to no shading. Cutesy simplified style. Colored lineart and shading included. Strudel Commissions (open) | USD AcceptedEditing this journal to be a general hub for Strudel-related Commissions, here is what I am currently offering as commissions! -Adding a small note, I can not accept Crumbs for non-Midveil orders as it is against the rules! Tilesets are now available again! Temporarily closing Crumb Slots because I want to have some USD in my Paypal! Edit: Smol and Icon commissions have been added! COMMISSIONS (OPEN)Commissions are open as of now! Commissions CLOSED [Paypal only]I’m so sorry, the points thing was short lived, I had no idea that I would not be able to withdraw my points to convert to money :\ I’ll continue to only accept paypal, I’m so sorry!! Keep in mind i'm really slow if i'm not motivated enough! Also, I have the right to turn down any character i feel i cannot draw ! I will NOT redo a drawing if you're not satisfied, but I can change little things. FULLBODY Commissions [ closed ]these are NOT first come first serve!